The ST-7000-C is a 1.2 GHz Intel-powered entry-level POS terminal that enables retailers to easily move to a low-cost and secure cashier environment from one of the world’s most reliable POS vendors. The high-performance POS terminal offers a real advantage to all types of retail outlets in the increasingly competitive marketplace. This POS control unit excels by increasing throughput while lessening manual processing of registered data especially in the face of staggering amounts of transactions. It is an absolutely reliable powerhouse behind the front end, promising benefits to store management that would have seemed impossible only a few years ago. Nevertheless we have found still more ways to increase its functionality. In this newest POS technical innovation, rather than offering equipment with a short life cycle, we have designed the ST-7000 so that the engine-board can be upgraded in the same cabinet, so the unit can continue to be used for years to come. Also, it is compatible with Legacy Interface, which means the retail customer can make the most of software assets available now and in the future. To reduce the total cost for retailers in respect to daily service, the unit is designed to allow easy maintenance. Potential overheating and interruptions can be prevented by confirming the CPU's surface temperature display and the CPU fan speed. Also, by releasing the front panel's security lock, it becomes possible to easily replace the HDD or the UPS from the front. As well, the number of screws has been reduced to permit easy removal or installation of the engine board. 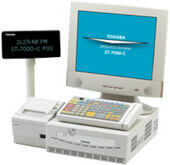 This page is part of GeneralManual.Com Network Toshiba ST-7000-C Modular POS Terminal User Manual.